Here we are in November already!!!! Linking up to Monika http://needleandthreadnetwork.blogspot.com/. 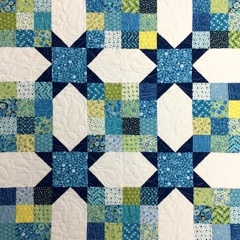 This week, I am working like crazy to get quilts out. 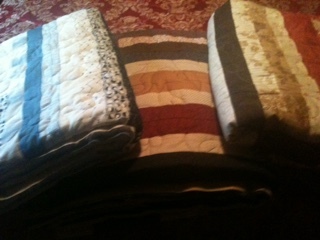 I did finish machine quilting the three jelly roll quilts for a customer...two or three more coming any day. I have this customer quilt in the frames being hand quilted now....about 1/3 finished. I added borders to this Grandmothers Flower Garden, which is hand pieced. 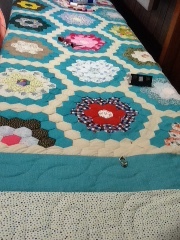 I had a log cabin dropped off yesterday to be hand quilted....that makes three besides this flower garden here now. But I love it!!!!! And I am working on my blocks for this months 100 club quilt with our fabric shop. Here is the quilt I am piecing, but mine will be queen size. Well friends, I think that is it for this week. Have a good one!